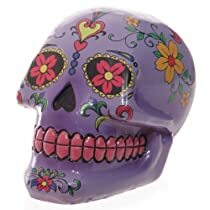 Day of the Dead Mexican Skull Money BoxThis item is made from resin.Each item is priced individually. Please note – When items are available in multiple designs or colours, at certain times due to low or uneven stock not all designs may be available. Items may also have an enforced purchase unit and therefore can only be purchased in multiples, see product purchase quantity for details.